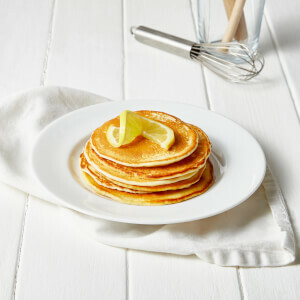 Start your morning the right way with our deliciously sweet and zesty lemon pancakes. Our meal replacement pancakes mean you can enjoy one of your favourite breakfasts, without all the guilt! Suitable on any of our Exante diet plans and the perfect morning indulgence for just 204 calories! Our lemon pancakes are high in protein and fibre too, to keep you feeling full and prevent any mid-morning snacking! Serve with any of our zero sugar syrups for a sweet treat! LEMON FLAVOUR PANCAKE MIX WITH VITAMINS, MINERALS AND SWEETENER. MEAL REPLACEMENT FOR WEIGHT CONTROL. INGREDIENTS: Skimmed Milk Powder, Wheat Flour, Egg White Powder, Soy Protein, Vegetable Fat Concentrate (Refined Soybean Oil, Maltodextrin, Milk Protein, Emulsifier (Soy Lecithins)), Flavouring (Sulphites), Whole Egg Powder, Inulin, Potassium Citrate, Vegetable Fat Concentrate (Refined Coconut Oil, Whey Powder (Milk), Milk Protein), Calcium Phosphate, DI Potassium Phosphate, Salt, Magnesium Oxide, Disodium Diphosphate, Emulsifier (Xanthan Gum), Vitamin Premix (Vitamin C, Maltodextrin, Iron, Vitamin E, Niacin, Vitamin A, Zinc, Copper, Fluoride, Chromium, Selenium, Manganese, Vitamin D3, Folic Acid, Potassium Iodide, Vitamin B6, Vitamin B5, Vitamin K, Thiamin, Biotin, Molybdenum, Riboflavin, Vitamin B12), Sodium Bicarbonate, Natural Colour (Beta Carotene), Sweetener (Sucralose). ALLERGENS: For allergens including cereals containing gluten, see ingredients in bold. SUGGESTED USE: Mix with 100ml of water. Spoon into a hot pan and cook each side for 1 minute. IMPORTANT INFORMATION: Use a meal replacement for one or two meals of a daily, energy restricted diet to contribute to weight loss or to the maintenance of weight after weight loss. Consume as part of a balanced diet and healthy lifestyle, maintaining an adequate daily fluid intake. Store in a cool, dry place away from direct sunlight. Suitable for vegetarians. These are easy to make, especially if you have wand whisk to get the lumps out, but still fine with a fork and a bit of elbow grease. I find they are best if you sit them for about 5 mins before cooking. Just a quick squirt of 1 cal spray on the bottom of the pan and you're away. They are a tad too sweet for me, but that is a minor quibble. I'd recommend a little of the Exante Raspberry or Maple Syrup toppings, to add a bit of moisture and interest to them. Exante used to do a Blueberry pancake and I also loved that, but I think it has been discontinued. I make these thinner than suggested, so they are more like large English pancakes than American ones. Then I roll them up with marscapone and drizzle sugar free chocolate sauce on top. Might even splash out with some chopped nuts and/or berries. These are great for when you just have to have something sweet but dont want to ditch low carb to do it. Hard to believe these are for diets! Was really looking forward to trying these, especially after all the good reviews. I think they taste revolting, like eating a pancake flavoured with lemon washing up liquid. Even smothering with the Exante maple syrup didn't mask the flavour. Will stick with the tried and tested porridge, shakes and soups. Love these pancakes, a hint of lemon and easy and quick to make. These really fill you up and have good texture, a definite favourite. Absolutely love this. Taste great with the maple syrup.